Oct. 11, 2018 – “An Introduction to Ethnobotany” @ Kirkendall Public Library in Ankeny, IA. Download the Flyer. Sept. 13, 2018 – 10:00 a.m. ~ 4:00 p.m. @ Iowa State Capitol in Des Moines “Wild Willpower PAC’s National Plan; Petition and Information Booth” — Stop by the remarkably beautiful, historic Iowa State Capitol building; our booth will be located on the first floor inside the rotunda (just below the big gold dome). Order copies of our original publications, learn all about our national plan, and feel free to sign our petitions. We look forward to meeting you! April 15, 2018 — Wild Willpower PAC maintained our first booth in the Iowa State Capitol. Handed out cards and introduced people to our national plan. View photos here. Mar. 18, 2018 — Distance registered Wild Willpower PAC as the first “nonconnected Civil PAC” in the country. Jan. 26, 2018 — Distance and Kevin arrived in Cedar Rapids, IA following ~ year and a half building a class action lawsuit for Standing Rock: see www.StandingRockClassAction.org (planning to file early 2019). Sept. 18, 2016 – Jan. 2018 — Stayed at Sacred Stone Camp and alongside Oceti Sakowin Camp media team while building an archive of what transpired and a the groundwork for a class action lawsuit on www.StandingRockClassAction.org. Sept. 7 – 18, 2016 — Distance and Kevin hitchhiked to Standing Rock/Sacred Stone Camp after seeing attack dogs released on local native people who were protesting against their ancestral burial grounds being decimated by construction workers building the Dakota Access Pipeline Project (aka “DAPL”). June 17, 2016 — Finished uploading second draft of testimony in regard to 2232 Commercial Ave. and our case. June 1, 2016 — Finished uploading initial draft of testimony including photographic evidence in regard to 2232 Commercial Ave. and our case. May 15, 2016 — Distance and Kevin robbed by 5 Kern County (CA) Sheriff’s Deputies (wrongfully ousted, made homeless, and barred from recovering personal property) from their home. Read the full story. 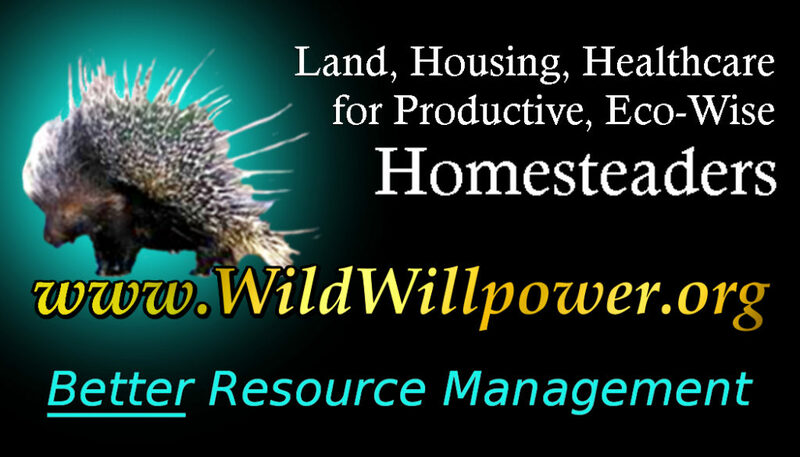 Aug. 31, 2015 — Moved in to 2232 Commercial Ave.
Sept. 22, 2013 — Held a town meeting in Nevada City, CA to discuss forming the first “wildharvesting cooperative” in the country. The Nevada City/Grass Valley area was thought to be an ideal location for this due to the fact that its a very artistic, nature-appreciating community. Here’s the flyer Distance designed for the event (click to enlarge). May 13, 2013 — First publication of The Forgotten Abundance of America’s Wildlands. Jan. 2011 — Cleaned the property of former California Lichen Society President Bill Hill in Fairfax, CA “in exchange” for getting to study lichen identification with him. He was a chronic hoarder, so cleaning the property when he left town to find his long lost family in Finland for 19 days, provided enough time to meticulously organize his home. In turn, this payed for several months’ rent and provided a work space to begin developing www.WildWillpower.org and related sites. His home became a landing base and respite between hitchhiking travels for many years. View photos. Sept. – Oct. 2011 — Hitchhiked to Modok National Forest to collect several types of obsidian to use for blade knapping with Gary Pickett and Bakersfield Knappers. Sept. 28 photos in Mt. Shasta. Mar. 13, 2011 — Distance stayed in Keyesville, CA (located in Sequoia National Forest) for approximately a month to begin additional learning and documentation alongside Richard Lonewolf and Randy White Feather, who frequented her camp. Dec. 4, 2010 — Volunteered at the California Lichen Society booth at the Mycological Society of San Francisco’s Fungus Fair at U.C. Berkeley. Documented several mushrooms while beginning to learn. View photos. Aug. 5, 2010 — Hiked Government Mountain, AZ in search for obsidian following a recent forest fire. Finding jet bla, black obsidian amongst freshly-burnt coals proved very difficult, but successful! View photos. Sept. 2009 – Jan. 28 2010 — Flew to Hawaii after invited by Ashawna Hailey to stay at her home in Kauai, HI; returned to California upon hearing of Former SJSU t Environmental Studies Professor Emeritus Frank Schiavo death on Jan 26 (received news Jan. 28). View Hawaii photos. Aug. 6 – 8, 2008 — Auditioned for American Idol! in Kansas City, MO; ended up making it to Round 3, at which time Distance got very sick and didn’t make it through. Jan. 4, 2007 — Received an apology letter and $1,500 check from the City of Ames in regard to previous arrest on ____________________. Read the apology letter. Dec. 2002 – 2003 — Attended Ocala National Forest Rainbow Gathering before traveling to the Hippie Shack in Nacogdoches, TX.